There were the times when people used to make a long list of required grocery items and then fix a day to purchase them. The most frustrating thing was to visit a crowded grocery store and then wait on the counters for hours. But now Uber For X business model has arrived. This grocery delivery portal provides much relief not only to the customers but also to the grocers. Nowadays grocers have no need to wait for the customers or argue with them for few bucks. This revolution of grocery store app development is a boon for such business owners. They have to just receive the orders through online grocery store software and customers have to pay digitally for the services. Grocery shopping delivery app gets much appreciation among the customers as now they can give their time to more important activities than visiting the store for buying the daily household products. Through grocery store delivery app, they have to just click on the required item and the ordered stuff will be just at their doorsteps within the few hours of placing an order. Even, if they want to collect their order themselves from the store, with a grocery pickup app all they have to do is to set a time when they will visit the store for pick up and their order would be ready before they reach the store. Grocers who are engaged in this business for long, often think to expand their business boundaries. Watching the success stories of other startups they also feel the need of grocery ordering app development for their business. It is obvious that through an online supermarket app, you can easily run and manage a business aggregator. 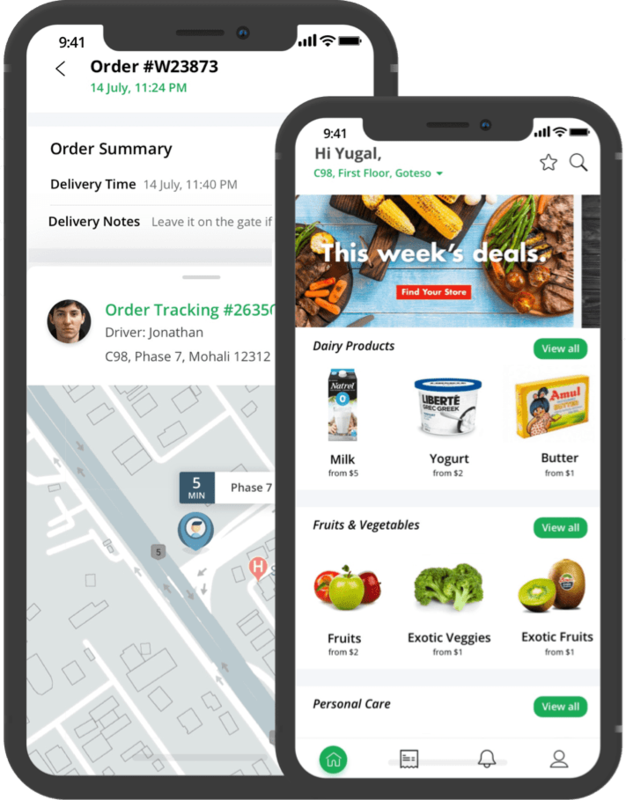 We are the best grocery delivery app development company fulfilling the business needs of grocers all across the globe. Our proficient team of top mobile app developers works with the motive of serving the best to our clients. For any kind of query regarding the development of a grocery sales app for your business, get in touch with us at info@goteso.com. 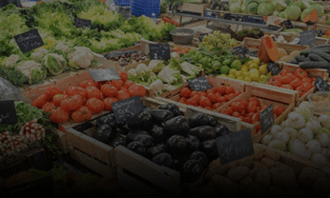 If you want to be a grocery aggregator for your own turnkey grocery business, which can help you to sell your grocery app to multiple vendors, then contact us for a quote. We help entrepreneurs and grocery owners to build their startup and grocery marketplace like Instacart or Grofers. 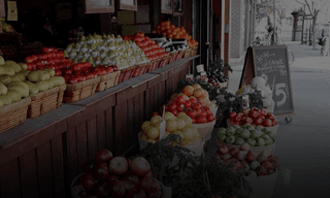 Manage your all grocery stores and supermarkets with a centralized dashboard. Now, you can easily track the sale of each store. Build your direct business pipeline from your Grocery store to doorstep of customer. With the help of tutorial screens, the customers can see the custom illustrations presenting the features and benefits of the app. Customers can set up their account just by typing the email address, phone number, their gender or social media accounts. The customer can schedule proper delivery time slot as per their own convenience. Now, they can get the orders whenever they want to receive it. If a customer needs the order instantly or shipping is not available then they can collect the grocery bags from the store. The customer can check the shipping status until the grocery order arrives. It can enhance customer's satisfaction and loyalty in your store significantly. The customer can easily know and compare the cost of grocery items. It increases customer experience as they can order as per their budget. With a single tap, the customer can instantly order the same items at any selected address. There will still be the option to change the order if required. The customer gets notified of updates regarding order status, offers, discounts available at that time. It will help the owner to retain their existing customers. The customer has the access to check all the previous orders, bills and detail of every current and past order history under "My Orders". Customers can search products based on product name, keywords or the categories with different search and sorting filters. The customer has the option to add multiple addresses in address list and can choose any of them during placing the online order. Customers can enhance their shopping experience by getting the benefit of discount vouchers and offers provided by the owner. Products can be easily shared on messaging apps or social media with the tap of a button. Important information about the product like the photo, link, title, and the price will be shared. The system will instantly send the digital copy of the invoice to the customer's email ID. It will contain all the information related to that particular order. Customers can pay the amount through online net banking, stripe, Paypal, credit cards, debit cards, PayTm and bitcoins (Blockchain based payment processing system). They need to add the card only once after that payment will happen with a single click. Customers can get the better idea of the quality of service from the ratings and reviews given by the past customers. This will help the owner to boost their sales with more customer engagement. Customers can easily chat with a support team in case of any query or updates regarding grocery delivery service. A real-time live chat feature can help customers to get the information without any delay. The customers can create their own wishlist of the items what they should have. They can purchase the items instantly from the wishlist without remembering their names. You can run and manage multiple grocery stores effortlessly from a single place. To attract the customers you can manage the gallery with eye-catching images and descriptive content. You can add or delete any of them anytime. You can easily add new vendors, staff members and managers with unique employee id. You can easily update the routine activities of staff members like attendance, expenses, worksheets, profiles, and other useful information in a panel. Cost of products, items, and categories can be changed in future. You can easily add items, categories and products as per your own convenience with availability status. Update your grocery order status within a second in real time mode. You can also track the field boy location for fast delivery. You can edit, add, view and manage all the details and other information of customers. Send notifications related to special offers, loyalty programs, events, discount coupons and promotional activities which will help you to engage more customers in a short time. You will get the grocery app with multiple payment gateway integrations which will help you to accept payments from a debit card, credit card, net banking, PayPal, Stripe, Bitcoins (Blockchain based payment processing system) and Paytm. Today, most of the entrepreneurs, grocery owners are accepting payments using bitcoin and ethereum. You can check the reviews and feedback from customers and get the idea of where you are actually lacking and how to fill the satisfaction gap. Admin can display the ads in different windows to increase the customer base. It makes the customers know about the updated services available in the store with animated images. You can generate insightful reports and analytics chart which can help you to make the decision for future plan. Without a complete sales insights and analytics graph, you cannot take a decision for business planning. You can nimbly check the reports and statistics of customers, daily sales, and expenses through the real-time graph in a dashboard. You can remind the customers of their scheduled product delivery through the short SMS or email. It increases the customers' satisfaction level. You can easily add new staff members and managers with unique employee id. The store manager can easily update the routine activities of staff members like profiles, attendance, worksheet, and other useful information in a panel. 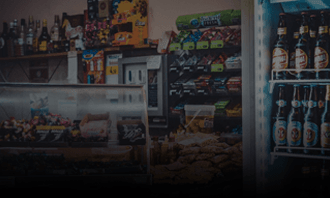 Store managers can easily add, update and delete their products and items, categories and subcategories, price and discount coupons with availability status. Update your grocery order status within a second in real time mode. Store managers can track order status and field boy location for fast delivery. You can add, edit, view and manage all the details and other information of customers. The store manager can send notifications related to loyalty programs, special offers, events, discount coupons and promotional activities which will help them to retain their customers in long-term. The store manager can easily generate insightful reports and analytics graph which can help them to make the decision for future plan. Maintaining the report and analytics of customers, sales and market are the major key component of every business. Analytics graph in the dashboard can help store managers to get the better view of the actual market. The store manager can easily track their daily sales and expenses for a better understanding of business growth. Built-In help chat can resolve the queries of customers in seconds. The store manager can enhance the user experience by in-app chat feature. The delivery agent will get the notifications for a new order. He/She will update the delivery status after delivering the grocery goods at the doorstep of the customer. Delivery agent can easily track the way and location of the customer using Google map integration. Delivery agent can update his/her profile like contact number, email id and photo using profile section.